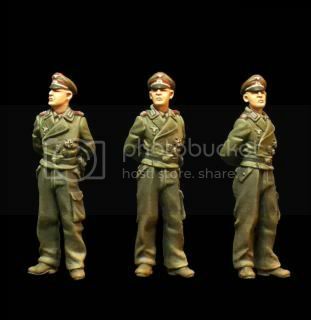 Here are 3 German Panzer crew figures now available from Cast48, whose creator is Tomas Castano. The sample set included 3 figures with 5 different heads. A well created plastic package with an inner bag and foam holds the figures; however, no directions nor painting guide is provided. 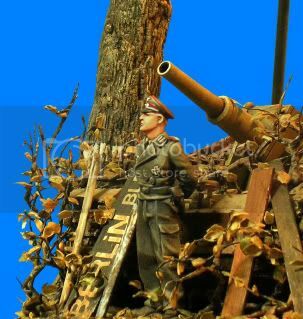 The Heer panzer uniforms are of the later war period, and they include a variety of headgear and trousers. One of the heads has a wound bandage wrapped around as an option. The detail on the faces are very good, but maybe both the heads and headgear are slightly on the larger side. All the pieces are as shown, so assembly was very easy. All gear is already molded on, so all you need to determine is which heads you want to use. Only one figure has arms to attach with a pair of headsets being held. This right shoulder and the left elbow needed some clean up of spruce attachment. The resin had a few small air bubbles found on the bottom of the feet and on the back of an arm. Once assembled, the standing figure measured 1.5 inches or 4M. Their size is compatible with most other 1/48 figures; therefore those 2 extra heads will come in handy to modify other figures. I decided to quickly add some paint to these to see how they might look finished. Although I did not complete all the details, I think the variety of ways these figures can be made is fantastic in terms of changing heads and different paint schemes available. On the Cast48 website I found the figures individually listed. The 1/2 figure goes for 5,60Euro ($7.25US) and the full figures run 8,40Euro ($12US). Rumor has it that Cast48 will be releasing more figure sets from the various countries involved in World War 2. I for one will be looking forward to these as 48th scale currently lacks many high quality choices in figures in comparison to the amount of vehicles available. 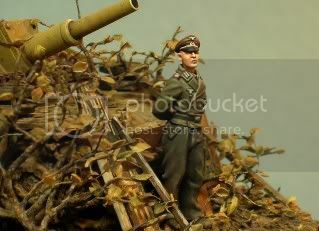 Since figures bring scale to a model, it is important to have available detailed and accurate figures as these. Highs: Figure sizes are accurate, well detailed, and help fill the quality figure void in 48th scale. Lows: A little more expensive then other high quality figures available from Evolution, Gasoline, and Total War Miniatures. Verdict: Very easy to assemble figures with nice detail. I'm really looking forward to future figure releases. I thought it would be fair to Cast48 if I also linked a pic of one of the figures to show what a professional can do with these figures as well. This one painted by Paul Keefe.